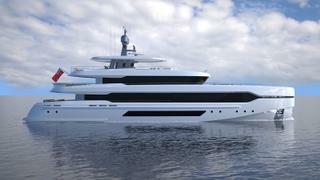 Australian design studio The Yacht Professionals used the recent Australian Superyacht Rendezvous to release a new concept, called Project E39. 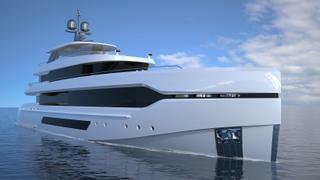 Developed for extended cruising in some of the world’s most remote destinations, this 39.5 metre design features a shallow draught and a vertical bow to maximise interior volume. The sharp profile and clean lines blend seamlessly into a curvaceous transom, which allows for extended al fresco seating areas on all three decks. On the main-deck aft, ten guests can comfortably gather around the central table for a light meal or an evening cocktail. A more formal dining space is offered on the upper deck aft and glass inserts in the bulwarks aft ensure superb sea views. 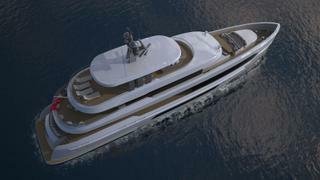 However, the star of the show is the superyacht sundeck, with its forward spa pool flanked by sunpads, a central bar area and room for four sunloungers aft, which can be sheltered by a retractable awning. Accommodation is for up to ten guests split between five staterooms, including a full-beam owner’s suite on the main deck and four further guest cabins on the lower deck. 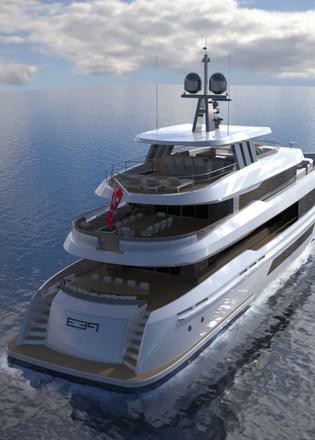 To further enhance her long-range cruising credentials, Project E39 has been designed with deep provisioning stores to prepare for extended spells at sea. Full details of the engine installation have yet to be disclosed.